North Chocolates is a North East-based, award-winning chocolatier. The company specialises in creating artisan chocolates using experimental flavours. Raspberry Beret is a particular favourite here at BW3! The lady behind the chocolates is Bev Stephenson. Bev was recommended BW3 by a colleague of hers and came to us with a brief to professionally promote her business online. Primarily she wanted an online shop to sell to the public but she also wanted somewhere she could direct retail outlets to as well as somewhere she could promote her attendance at local food fairs throughout the year. 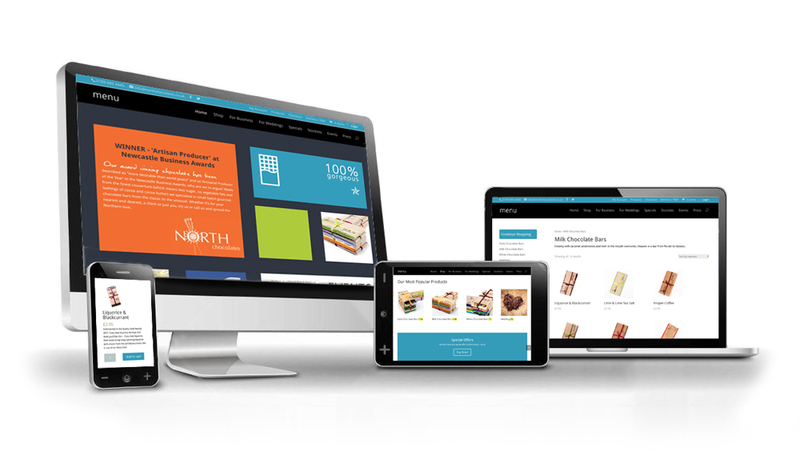 We worked with North Chocolates to build a site which echoed the existing branding. We used WooCommerce as the shop front, which worked well to display the products as well as allowing us to organise them with a comprehensive search and filter. WooCommerce has excellent payment integration and is also intelligent enough to cope with different variables concerning postage and packaging costs which was a requirement. BW3 took the majority of the product shots on the website and Bev was trained to use the CMS. We still work with Bev regularly to update products and costs however Bev finds the CMS easy to use and is able to update her own content and events. Paul not only set up my website but made it simple enough so I could adapt and update it myself – not only a huge saving in terms of cost and time but (for me) also a minor miracle. He listened to me as a client, didn’t charge stupid money, made suggestions which I would never have thought of and is always quick to respond if I have a problem; within 3 months my site had paid for itself.